Early last week, I went on another UBC adventure in an attempt to escape from the heat. Right after getting off the bus, I saw a crowd of students holding colourfully highlighted stacks of paper, waiting for their exams to start. I then went inside to see what UBC's exam rooms were like, and the first thing I saw was a sign with the words "Bird Coop" and "Dojo". I'm sure those are superb locations for writing exams. Next, I went to explore the science buildings, but I quickly noticed that it was even hotter inside than it was outside. On each entrance was a sign that said "UBC Heating System Upgrade". If that is their main concern, they really need to rethink their priorities. After suffocating for a few moments, I finally found what I needed: a large -80°C freezer. Too bad it was bolted shut! How could they be so heartless?! That's it. It was time for another sushi adventure, since, as we all know, sushi is the solution to every problem. My plan was to go to Takumi Japanese Restaurant to enjoy some fancy authentic nigiri, but unfortunately, they changed their schedule and were no longer open for lunch on Tuesdays. 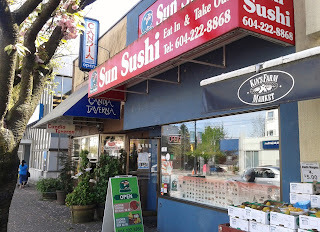 I walked around for a bit and found Sun Sushi, and since it looked rather popular, I went in and gave it a try. The dining space is actually quite large and can seat at least 40 people. There were multiple chefs and servers on duty, and I had the luxury of being seated right beside a very excited diner who constantly sounded like a YouTuber on a megaphone. Despite my "Moderately Priced" rating, the prices were very budget friendly relative to other restaurants in the area. 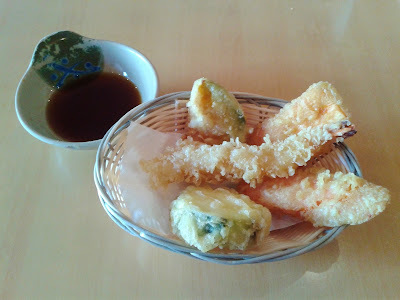 This Appetizer Tempura cost only $4.25 and came with zucchini, kabocha, prawn, carrot, and sweet potato (one piece each). The sweet potato was the highlight of this dish. The other items exhibited issues such as being cut too thick or being too dry. The batter was not too heavy, but it was unusually hard. To those of you who have been diligently following my blog, I am sure you are tired of me constantly ordering Dragon Rolls, so allow me to present to you the all-new, exclusive Ebi Salad Dragon Roll. This revolutionary roll comes with chopped shrimp, masago, and savoury BBQ eel! The salad shrimp tastes just like your typical imitation crab meat, but with a creamier, richer flavour. This roll also features mediocre sushi rice, so you'll definitely enjoy this roll if you are not picky about the small details. Order yours now! Despite the menu being quite extensive, I could not find any particularly special fillers, so I just went for the Chirashi Sushi. I was surprised that for just $13.95, I received one piece of hokkigai (B), five thin pieces of toro (B), one piece of ika (B-), two pieces of salmon (A-), two pieces of tamago (B+), one piece of ebi (A-), two pieces of tuna (C+), and one piece of saba (B-). The highlight of this dish was the salmon sashimi, which had a rich, buttery flavour. The tuna was my least favourite because it tasted quite fishy, though its placement right next to the saba may have contributed to the fishiness. The rice would have benefitted from having a bit more moisture, and it felt slightly undercooked. The service was unremarkable, but it was generally polite and efficient, at least during my visit. Food-wise, the quality tended to hover around average. It is evident that the lower prices are what makes this restaurant popular. 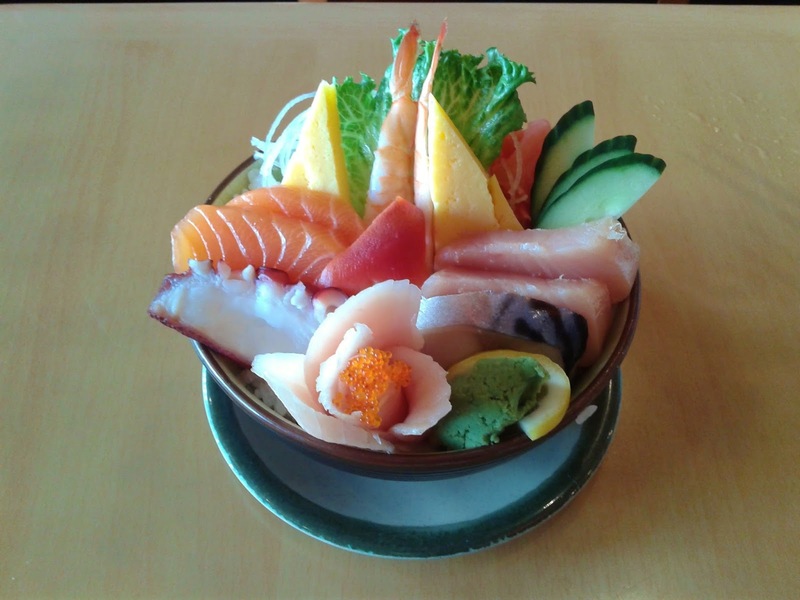 If you wish to inflict more damage on your wallet, Hime Sushi and Takumi Japanese Restaurant are good choices nearby. "Bird Coop" and "Dojo" LMAOO whatt, what building was that in? LOL I think it was the Student Recreation Centre. Why would they keep birds in there though?? Haha looks like my tuition paid off!